In the blog Mongabay I read an interesting article on the Asian tapir. http://news.mongabay.com/2013/0423-hance-malaysia-tapir.html . Tapir's is an animal that lives in rainforests, a shy animal that is hard to spot. It has said to be endangered but they have not really had good knowledge of how many animals there are today. It is now estimated that there are about 2000 tapirs in the Malaysian forests after setting up camera traps. With these camera traps they could show that there were more than they thought. 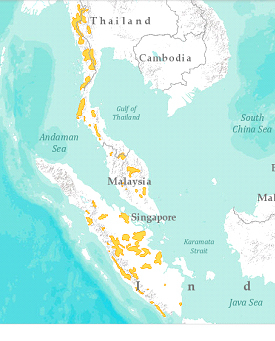 It is about 9.5 animals/100 km2 and there are still large areas that remain in Malaysia that can accommodate this animal. In these forests they chops down trees randomely and it does not seem to affect these animals negatively. The tapir can weigh up to 540 kg. The three species found in South America are smaller and have a brownish fur. The tapirs are protected but are hunted in some places. Muslims in Sumatra usually do not hunt and eat them for they resemble pigs. The biggest threat to them as well as to other animals is that their environment is changing. The forest land becomes the oil palm plantation, for example. Tapirs appear until quite recently also to have been living in Borneo. How many low lands tapir that are left I have not found out but of the central american species it is estimated that 5-6000 are left. 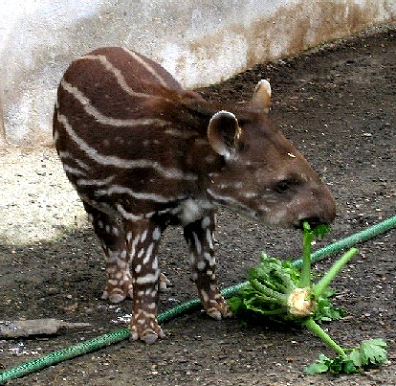 The smallest tapir is the mountain tapir living outside the tropical rainforest, it has a thicker coat and white lips. It is estimated that there are about 2-3000 left of this. If the scientist would set up camera traps in this part of the world, maybe you'd get the same results as for the Asian tapir. Tapirs main enemies are big cats and human hunting. See picture for mountain tapirs. 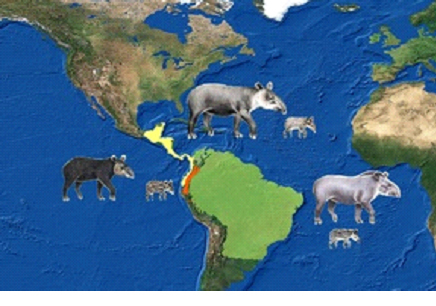 Area of the American tapirs. 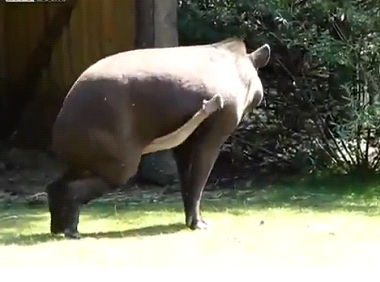 Tapir is also known for something else that you can whatch in these videos.